Enjoy downloading the Free Burger Restaurant Flyer Template created by DusskDesign! The Free Burger Restaurant Flyer Template is a Free Photoshop PSD Flyer to use for your next BBQ and Grill Party Event. Download the Barbecue Weekend Free Flyer Template as free PSD flyer. All main elements are editable and customizable. You can edit the main text via text tool, the model image you can replace via smart object, right click edit smart object in your layer menu. The flyer is fully layered and organized to keep customization very simple! Fully Editable, you can modify everything very easy and quick. Changing the color style, pictures, text. It is well organized in folders and layers. Burger Flyer is just the free version of a 3 part burger menu templates. 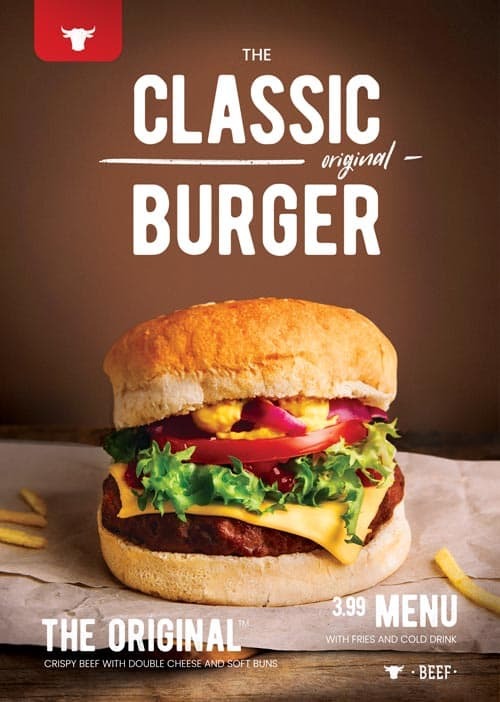 This flyer features a tasty burger on a dark wood background with a great bold title typography. You can use this for a burger new product, a burger menu cover, bar & grill menu and fast food promotion. This burger template is editable with Photoshop, and you can change the text and logos. Check out this outstanding Free Burger Restaurant Flyer Template for Photoshop! This amazing freebie was created to make it more easy for you to create the perfect Restaurant, BBQ and Grill Party Flyer Design. Take advantage of these ready-made and easy to edit freebies. Create amazing flyer and poster templates or create stunning social media banners for your party events.